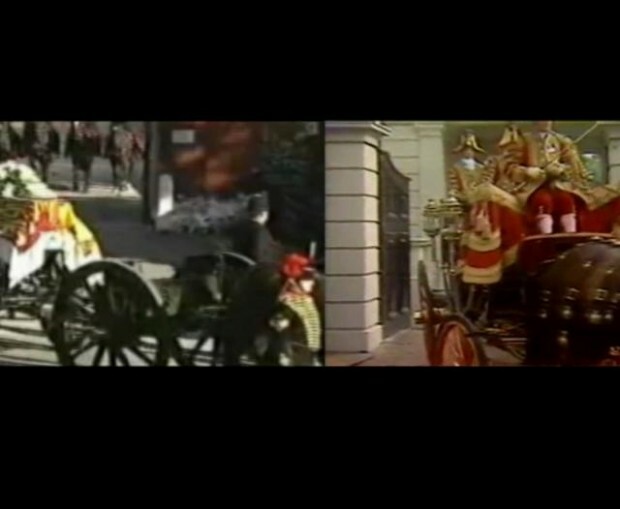 The Gates is a two-channel video projection that pairs the bridal and funeral processions of Princess Diana as the carriages emerge from the gated walls of Clarence House and Kensington Palace. Both carriages pass before an endless stream of people who have lined the streets to stare in awe and cry. Both video images have been slowed down and paired so that the movement from past to present, life and death, appear to unfold in one continuous shot panning from left to right. Past, present, and future appear to occur in a simultaneous holding pattern. The work was inspired by two renaissance wedding chest panels by Francesco Pesellino: The Triumphs of Love, Chastity and Death, and The Triumphs of Fame, Time and Eternity, both of which reference The Triumphs, by Francis Petrarch, a 14th century Italian poet. Renaissance wedding chests (or cassoni) were typically filled with the bride’s dowry or other household items, and then moved in a public procession from the bride’s home to that of the man on her wedding day. Pesellino’s panels depict five parade carriages (including those for wedding and funeral) that move through time culminating with Eternity. In Pessellino’s panels the imagery is laid out from left to right, as if we should read the events sequentially. Yet the action happens simultaneously, as if time were represented by a continuous cycle of the present. Maura Jasper is a visual artist whose works encompass drawing, experimental video, performance and participatory projects. Primarily interested in portraiture and the passage of time, her work investigates how pop cultures and histories shape and inform identity. She has exhibited and screened work at venues such as Artist’s Space, Threadwaxing Space, the Institute of Contemporary Art in Boston, and the Centre for Contemporary Images in Geneva. She is probably best known for her work as a co-founder of Punk Rock Aerobics, the DIY workout and her album art for Dinosaur Jr. She currently lives and works in Indiana, where she teaches video and intermedia arts at Ball State University.